At LevelEleven, we study sales contests. We just have this thing for collecting new wisdom on what works best for motivating sales teams and optimizing sales performance. Recently, we decided to summarize some of it — to come up with an updated list of our 10 best tips for building the ultimate sales contest. Today, we want to share them with you. Our most successful partners plan their contests a quarter, and sometimes even a year, in advance. And when we say plan, we’re not just talking contest themes. Knowing the contest structure isn’t as important as choosing the right behaviors to motivate. Having a plan in advance also allows you to easily plug in a contest when you need a quick lift for your team. 2. Remember: Timing is everything. Map out when contests will run to avoid company priorities, holidays, employee vacations, annual conferences or anything else getting in the way. Make contests fun and interesting by layering on engaging themes and funny incentives. This will amplify your team’s energy around the behaviors you’re motivating. Choose only 1-2 behaviors to motivate per contest. Focusing on too many behaviors will complicate contests, jeopardizing participant success and engagement levels. Aaron Ross, sales influencer and author of “Predictable Revenue,” summed up this one simply in an interview with “For Entrepreneurs”: “Any individual that tries to juggle too many responsibilities, will have a much lower ability to get things done.” Aaron’s actually talking about adding prospecting to a sales team’s to-do list, but it makes for perfect sales contest advice, too. Short bursts work best. Take advantage of salespeople’s natural sense of urgency, and keep in mind that reps tend to lose focus with contests longer than 30 days. We recommend no more than 25 people in one contest. Who’s going to be motivated while trying to dig out of 40th place? If you lead a large sales team, place reps with similar skill sets or from different divisions in their own separate contests, or build team contests. Mark Roberge, Chief Revenue Officer of the Hubspot Sales Division, is an advocate of the team contest idea. When growing out the Hubspot sales team, he would run about a contest a month, mostly all team-based. In his new book, “The Sales Acceleration Formula,” Mark talks about the results he saw from team vs. team campaigns: “The positive impact on team culture was remarkable. I would often see high-performing salespeople help out their teammates who were lagging behind. The salespeople who were lagging behind worked late in order to avoid letting their teams down.” Not bad impact from one tweak in a sales contest’s structure, right? Put contest standings everywhere you can, so the behavior you want your reps focused on stays in front of them. If you can, display sales leaderboards around the office. Send out emails. Use your CRM for notifications. Leverage any team social channels you use, like Chatter or Slack. Bring up the contest in team meetings. Get the point? Of using leaderboards in particular for this, Heather said: “The culture it drives on the sales floor and having something ‘always on’ that the sales management doesn’t have to call out and promote the whole time is key.” And this is something we hear often: That automating sales contest notifications to do the talking relieves pressure for sales management as it motivates their teams. 8. Make it a big deal. You are running a contest for a reason — to lift sales productivity around key initiatives and behaviors. Celebrate this. Introduce contests with enthusiasm in face-to-face meetings or on conference calls. Get everyone together. Offer transparency into how participants will be rewarded and encourage the team to ask questions. Just make sure to do this before the contest actually launches. This commonly forgotten step makes a huge difference. Ever heard that if you can’t measure it, you shouldn’t do it? You need to know a contest’s impact, or you won’t be able to evaluate whether it made a difference and what you can learn from it. As for gathering data, if you can’t pull the right numbers pre-contest from your CRM, motivate the key behavior beforehand without a contest. Measure the outcome, and that’s your baseline. Then launch your contest, and see what happens. For example, let’s say you’re running a contest to get your team following up on leads from a huge conference. Tell them in a meeting, emails and whatever else you use to communicate priorities that these leads are critical and that you need everyone focused on turning them into opportunities. Do this for one week. See how many opportunities you get out of it. Then launch your contest for a week, giving points for opportunities booked off of leads from that same conference. How do the numbers compare? You and the rest of your leadership team play a huge role in your team’s contest engagement and overall motivation. Take advantage of this. Have your CEO send a note halfway through your contests, recognizing top performers — or better yet, display a leaderboard right outside of executive offices. Once your sales team knows leadership is paying attention, contests can produce a whole new layer of motivation. 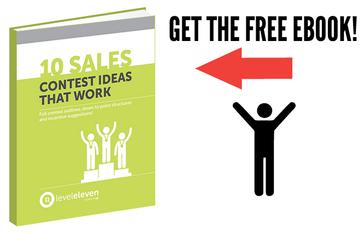 There you go: The 10 tips that will get you the ultimate sales contest. We’ll dive into some of these more in future posts. In the meantime, we’d love to see any ideas or feedback you have to add in the comments below. Need to boost productivity with a sales contest? These 10 tips will set you up to do just that.